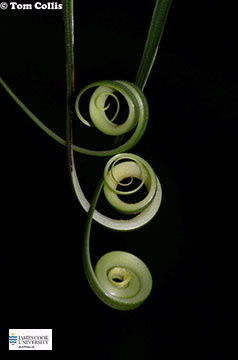 A slender vine, rarely exceeding 2 cm diameter. Common and widespread, it grows in a variety of wetter forest habitats. Usually several stems arise from a single rootstock, the young leafy stems often looking like a grass plant. Leaf blades are about 9-30 cm long x 2-3 cm wide, with the tip apex coiled upwards to form a slender but very strong tendril. Flowers small, white, in terminal inflorescences. Fruit pink, fleshy, about 6-8 mm diameter. Known as Pola-kara by the Yirrganydji and Djabugay peoples. The fruits are edible. Medicine from the vine is used to treat eye infections and toothache. The plant is woven into rope for nets and traps. JCU acknowledges the Yirrganydji and Djabugay Peoples for sharing their Indigenous Knowledge and pay respect to the elders past and present.